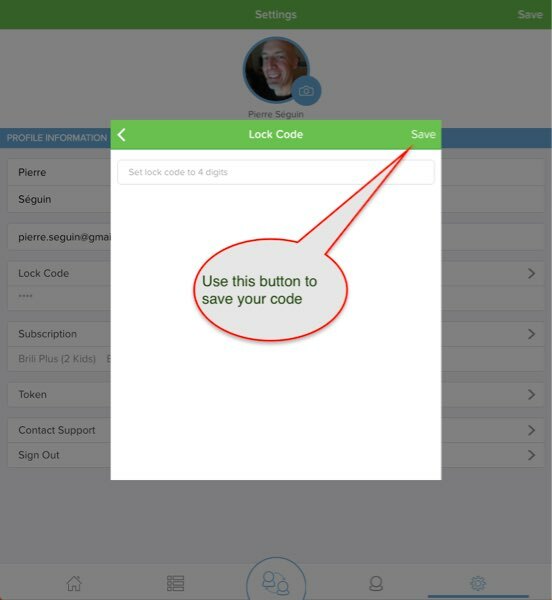 If you have created a lock code and it's not working, here are some possible solutions. 1- Make sure all of your devices are upgraded to the latest Brili version. In early 2017, we made a change to improve the security on your lock code. So if you set a lock code on the latest version of Brili but then tried to use the code to unlock on an older version of Brili (on a different device) that would not work. 2- If all your devices are on the latest Brili, you may have run into a bug that occurs in some situations. As of July 20th, 2017, we have a fix that's in the next release but in the meantime, here is a workaround. - When you’re in the window/screen where you actually enter the digits for your lock code, you click “Save” to save and close the window/screen. - This brings you to the main parent settings screen. It has a “save” button in the upper right corner that you don’t actually need to tap for your pin to be saved. You can exit the screen using the main navigation links instead. 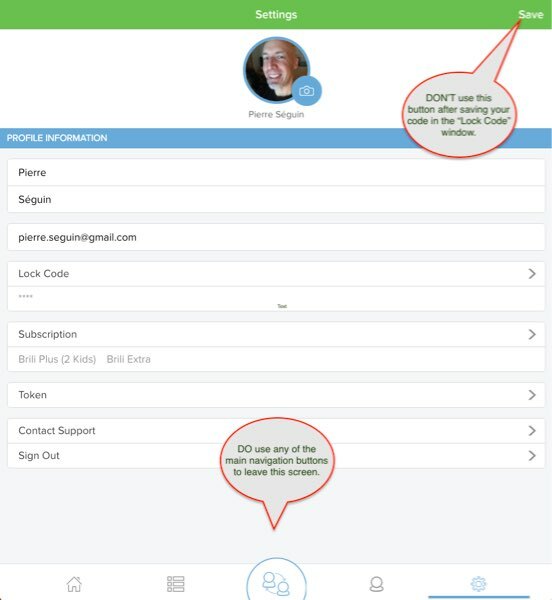 The bug we found is that if you tap save on the main parent settings screen, it corrupts your PIN code. A fix will be in the next version. For now, the workaround is to a) set a new code and b) use the save button on the window where you enter the digits, then c) AVOID the save button on the main parent settings screen.